Inside: Our abrasive world is desperately in need of gentleness. 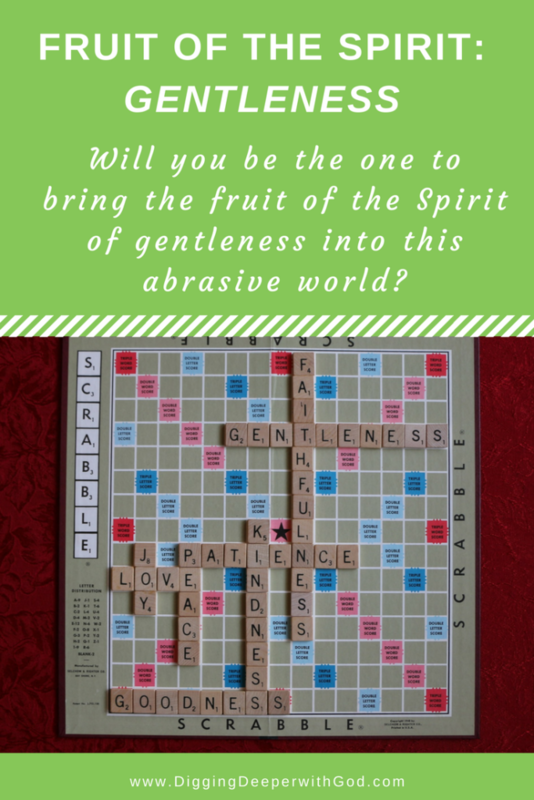 Will you be the one to bring the fruit of the Spirit gentleness into your relationships? For the first time in weeks, I braved the grocery store–on a Saturday, no less! I have been using grocery pickup, which I have fallen in love with. My excursion today proved why: The aisles were crowded, the shelves were picked over, and I was tempted to buy goodies that I don’t pass by when I shop online! As I circled back, because doesn’t shopping in a store always involve circling back? . . . As I circled back to the cold foods to pick up a bag of blueberry bagels, I heard a ruckus coming from that very section. I rounded the corner to find a mom flailing her arms, yelling at her very young daughter who had apparently wandered too far ahead for Mom’s liking. It wasn’t the kind of yelling you do after you’ve been legitimately scared you had lost your child. It was the I’m-going-to-cut-you-down-because-I’m-mad-at-something-else type of shouting. A whole family group stood by, clearly embarrassed by the mom’s temper. I wanted to cradle the little girl’s chin in my hands and tell her how beautiful she was and that she was designed for something big in this world. At the same time, to tell you the truth, I wondered if she had wandered off and needed discipline, even if I disagreed with the approach! Who was I to interfere in this family’s situation? So I chose to plow right through the dumbfounded group, eyes aimed at the blueberry bagels, hoping my presence would stop the yelling. It did. I have been processing this, wondering not only if there would have been a way to step in and defend the little one, but also if am I any different! Who am I to have judged this, because have I not done the very same thing? It’s just that I didn’t choose the public place of a grocery store! Have I not become unhinged at the slightest fault because in actuality I am mad that (take your pick) I’m the only one doing the dishes, or the dog tracked mud through the house, or I had a bad day at work? We lose our temper and use harsh words, and we don’t do this with just our family. We lash out online or in emails, forgetting that the people who hold a very different view than us might actually have a legitimate viewpoint (the horror) and they are loved by our holy God just as much as we are! I am guessing most people reading this have not used harsh words online, but have you thought them? Yikes! Me, too! As with all of the fruit of the Spirit, we look to Jesus for how we can live out gentleness. Now, you’ll remember that Jesus threw the money changers out of the temple, and he chastised the Pharisees for their hypocrisy. So he is not all puffy-white-cloud soft! But much of the imagery foreshadowing Jesus’ life on earth and much of his actual ministry demonstrated humility, a focus on others to the sacrifice of himself, and patient endurance of wrongs inflicted on him. We watch Jesus eat with the outcasts, heal the sick, touch the leprous, and weep at his friend Lazarus’s death. We ponder the mystery of his humility as he lets women anoint him with expensive perfume and as he ties a towel around his waist and washes his disciples’ feet. 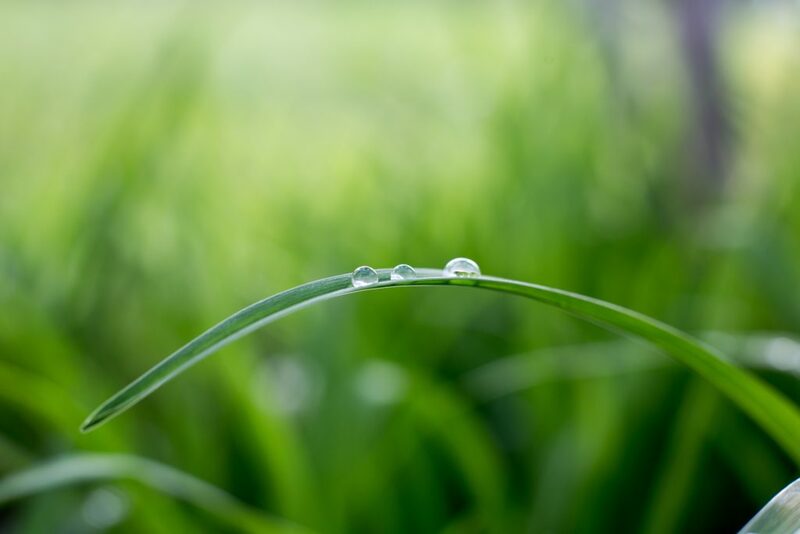 All this, so that when the child runs off, the dog tracks mud through the house, and political opinions flare, we might spread gentleness, softening our abrasive world and letting people glimpse the gentle Shepherd, who, because of his sacrificial humility, can give us rest. 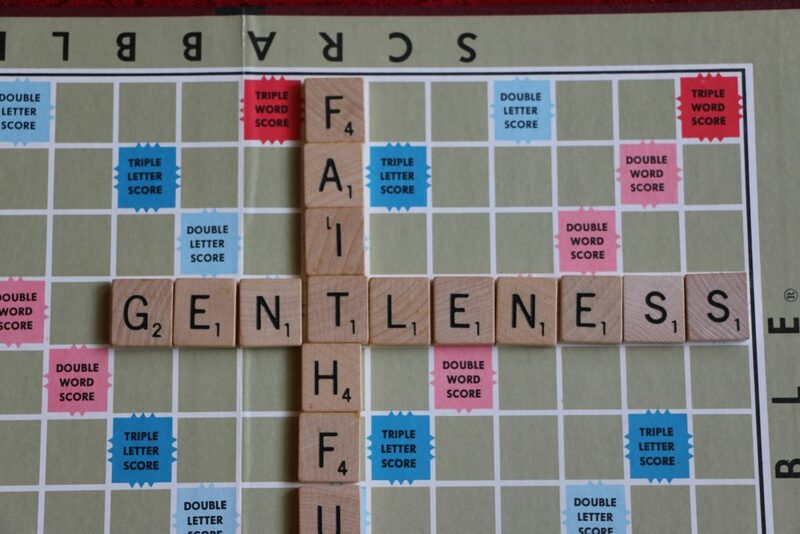 How might you spread gentleness today? Many older Bible translations use the word meekness in Galatians 5:23, whereas modern versions translate it gentleness. Matthew Poole’s Commentary explains this quality as “forbearance of passion, rash anger, and hastiness of spirit.” Forbearance is restraint or self-control. The Expositor’s Greek Testament says, “Meekness is the outcome of true humility, the bearing towards others which results from a lowly estimate of ourselves.” A lowly estimate of ourselves does not mean having a low self-worth; rather, it means not thinking of ourselves as higher or more important than others. 1. When do you find it most difficult to restrain from rash anger or hastiness of spirit? Ask God to bring these moments to mind, to forgive you of them, and to work gentleness in your heart. 2. In what ways do you see humility in Jesus’ life? How has the Holy Spirit spoken to you through this devotion about having a humble spirit? 3. Another way of considering gentleness is having “gentle submissiveness to divine will” (Ellicott’s Commentary for English Readers). Meditate on whether you are submissive to God’s will: Do you ask God to help your will come to pass, or do you ask God to help you to be a part of his will? Ask God to mold and shape your will to match his. Thank you, Jesus, for humbling yourself to become obedient to the point of death, even death on a cross. Forgive us for not acknowledging the depth of your sacrifice and for relying on our own will and not yours. 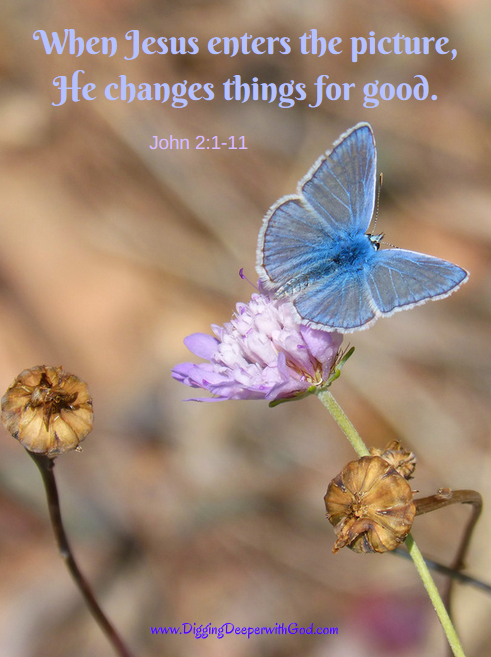 Please work gentleness in our hearts, changing harshness to kindness and abrasiveness to softness. Help us to see other people as you see them: beautiful creations, designed by you to do big things in this world. Take Jesus’ yoke upon you and find rest for your soul! Let these songs inspire you to rest in Jesus’ gentleness and to share the fruit of the Spirit of gentleness. Jesus, Tender Shepherd, Hear Me (Keith and Kristyn Getty) This is a sweet song that could be used for family worship or evening prayer.